Guitar players have become the 'all new clientele' in salon today. Within 3 months of launching and promoting this service, I have gained 5 clients who benefit the service of nail extensions to aid their career. I currently have 1 lady and 4 men. Yes that's right, men have braved entering this industry. Guitar players can use any of the three nail systems that I offer - Gel, Acrylic and Fibreglass. They will usually only want the one hand that they play with beautified/manicured. All 3 systems create different sounds on different playing/strumming techniques and on my feedback, different systems cater for different techniques. As a musician you will yourself favour a system that suits you and you're playing. I have heard several horror stories from my clients that involve all sorts of pre applied strengtheners and objects that I'm am sure could cause more harm than good. Some of these you may be familiar with - ping pong balls cut to shape of nails and glued to nail beds , wood glues used as adhesion for strengthening, craft glues used for strengthening. Welcome to Posh Paws guys!!!! Away with all that. On introducing any new male clients wanting to benefit from this service I can assure you that although this industry is very female orientated nail extensions today can look and feel like natural nails. My male clientele generally opt for a 'dulled' finish appearance rather than a naturally high shiny finish. I will create, shape and define your extensions to your personal preference. Duncan in particular, likes to have his nails, oval to one side and square to the other. All helps with his playing techniques and Duncan will always carry a nail file to tweak his own shapes and personal preference also. So you can walk out of my salon in confidence and not worry egoistically. I offer a professional service and would make you feel very welcome in my salon. Uniformity and diversity of tone. No more worrying about your nails. To use with or as a plectrum, or instead of. 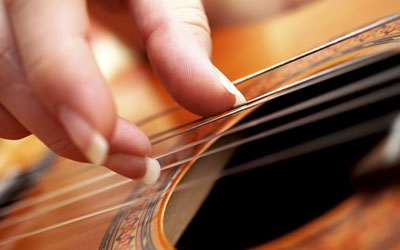 Diverse playing techniques; flamenco, steel string players, finger picking styles. No more damage caused to nails with use of glues and resins. No more having to settle for playing with imperfect nails. A protection for your natural nails. They feel and sound like natural nails.